The myCharge Portable Power Outlet is just what the name implies. 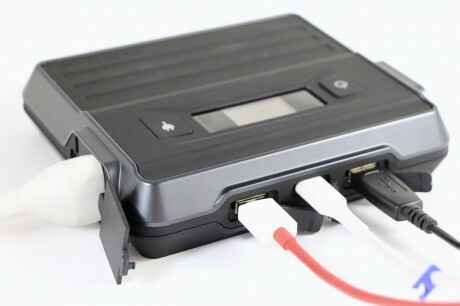 This enormous, rechargeable battery lets you power smartphones, accessories, tablets, laptops, and even televisions when AC is nowhere in sight. If you need portable power to get you through a weekend away from it all, the myCharge Portable Power Outlet may fit the bill. 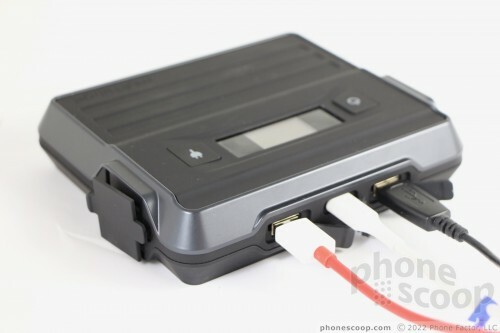 The majority of modern mobile devices have internal batteries that cannot be removed. The good news is that portable rechargers are available in every size, shape, configuration, and price point. While a small 3,000mAh power stick might help you get your smartphone through the end of a busy day, you'll need something more robust to recharge your phone multiple times, or recharge larger devices like laptops or tablets. Enter myCharge and the Portable Power Outlet. This battery pack has enough juice and charging options to carry you and your gear from Friday to Sunday when outlets aren't an option. The Portable Power Outlet is a huge, heavy piece of hardware. It's not something you're going to toss into a backpack and lug around all day. It's the type of device you bring camping, tailgating, or some other power-starved place, and set it down. 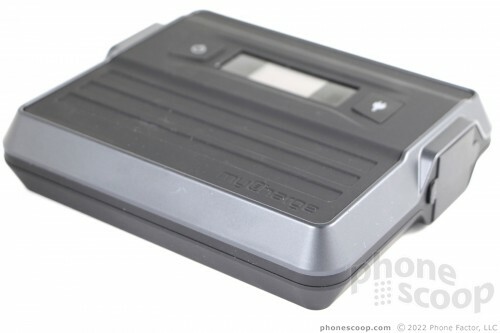 The battery is encased in rugged black plastic. 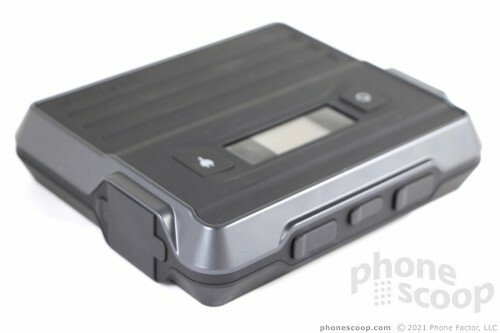 The pack measures 5.75 by 5 by 1.4 inches and weighs in at 1.05 pounds. It feels a lot heavier to me; it's quite dense. myCharge doesn't make any claims as to the power pack's toughness, but it feels rugged. It can handle being bounced around in the back of an SUV or pickup truck for sure. 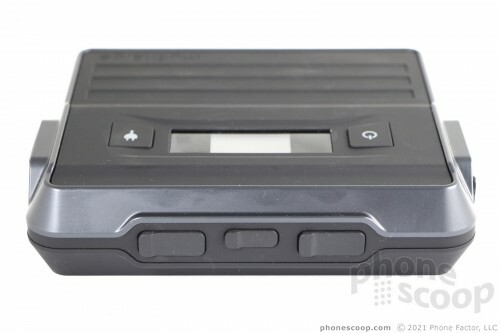 On top you'll see two buttons and a monochrome display. The left button turns the entire unit on/off, while the right button explicitly controls the power outlet. The buttons are well-marked and work well. The monochrome screen is bright enough to see in all lighting conditions. 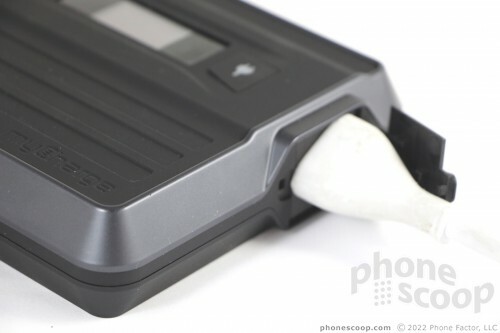 It shows the overall charge of the entire battery and which ports are actively being used for charging purposes. There are a lot of ports and hatches. 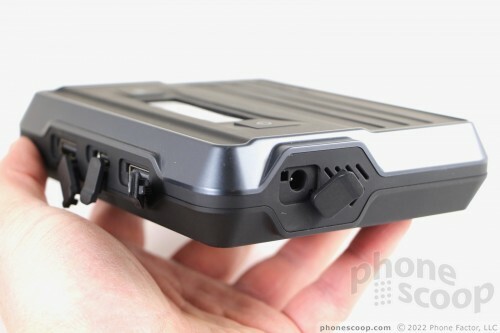 myCharge put the main power input port on the left edge. It's a proprietary deal that only accepts the wall charger that ships with the battery pack. A standard, three-prong electrical outlet is on the right edge. This is where you'd plug in your laptop, TV, or other large item. 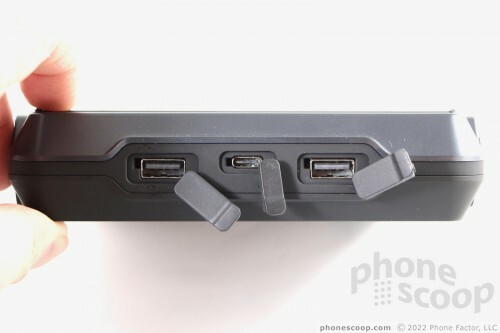 myCharge includes three USB ports on the rear edge: two USB-A ports and one USB-C port. All five ports are protected by hatches, which help keep water, dirt, and snow out of the unit. I didn't have any trouble interacting with the ports, hatches, and controls. The variety of ports means you can plug in pretty much anything easily. I like that the entire battery has a distinct on/off button, and a separate button for controlling whether current is sent to the power outlet. The myCharge Portable Power Outlet is a beast, but it's dead simple to use. Let's get down to brass tacks. 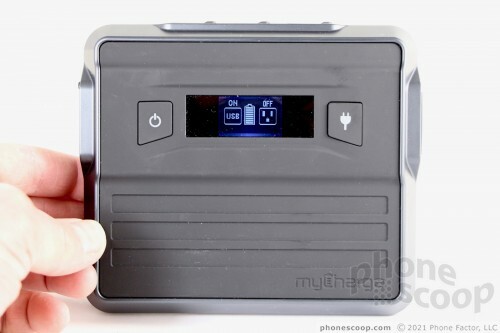 The myCharge Portable Power Outlet has a 20,000mAh lithium ion battery with a maximum total output of 65W. 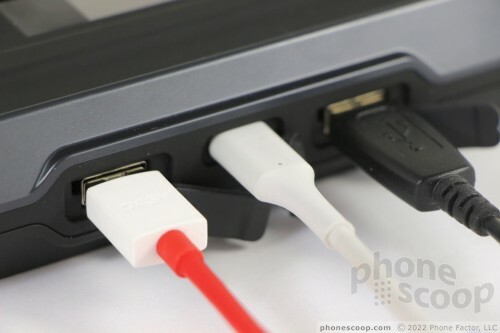 The USB-C port can charge at 3.0A, while the USB-A ports can charge at 2.4A. If you use all three at once, output totals 3.4A. The AC power outlet handles a maximum of 65W. The large 20,000mAh reservoir of power means you can charge most phones six or seven times. Or, you can charge a phone, a tablet, headphones, a smartwatch, and other items one or two times each. Of course, it depends on what gear you have and how large those batteries are. The iPhone X, for example, has a 2,716mAh battery. You can recharge it fully about 7.4 times with the myCharge. The Galaxy S9+, with its 3,500mAh battery, can be recharged fully 5.7 times via the myCharge. You can recharge a standard iPad about four times, or your average pair of Bluetooth headphones about 40 times. The myCharge Portable Power Outlet's real claim to fame is the three-prong electrical outlet that allows you to plug in a laptop. Here's where you may run into some trouble. With a limit of 65W, you will find it is incompatible with some laptops. For example, the newest MacBooks ship with 87W power adapters. That's too much for the myCharge Portable Power Outlet. My 2015-era MacBook Pro didn't work, either, but brand new Asus and HP Chromebooks did. As long as your laptop or other device requires 65W or less, you should be good to go. I tested the myCharge with a 24-inch TV and it ran for about 5 hours when plugged into the battery. I tested the battery with AC-powered Bluetooth speakers, which ran for close to 12 hours. I successfully charged pretty much every doo-dad in my office via the USB ports. myCharge built some intelligent tech into the Portable Power Outlet. It is able to determine the correct amperage needed by each device and supports rapid charging on compatible devices. myCharge claims its power bank can recharge phones and other items up to 65% quicker than competing products. The myCharge recharged the Galaxy S9+, for example, from 40% to 100% in about an hour. It takes time to charge the myCharge itself. I'd say allow for 2.5 hours or more to get the myCharge from a low charge to 100%. 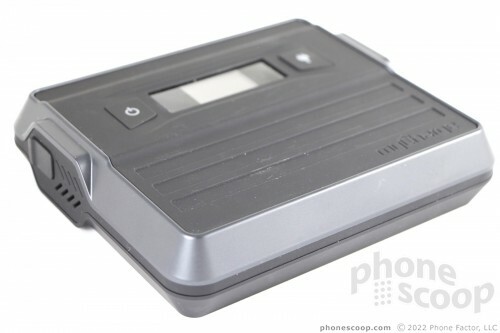 The battery supports pass-through charging. 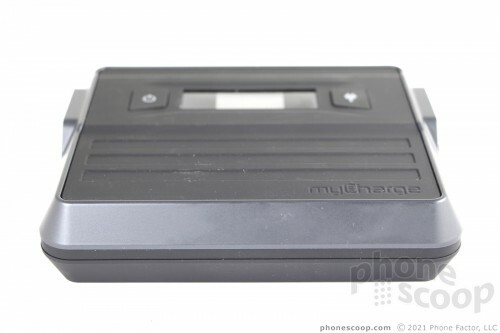 This means if you plug a device into the myCharge while the battery itself is plugged into the wall, the myCharge and the connected device will both charge at the same time, albeit at a slightly slower rate. There will always be a need for power, whether you're at home, on the road, tailgating before the big game, or away for the weekend. Sometimes ensuring you have access to power takes planning and foresight. With the myCharge Portable Power Outlet with you, there's one less thing to worry about. With a 20,000mAh capacity, it has more than enough juice. The selection of USB ports and the full-sized, three-prong power outlet mean you can plug most anything into the myCharge and find some current. The myCharge Portable Power Outlet is not cheap. It costs a hefty $180. You can find portable chargers for phones with the same capacity for about one-third the price. What sets the myCharge apart is the real power outlet and ability to push enough current for certain larger devices, even TVs! In my view, the myCharge is worth the extra cost, particularly if you're a weekend warrior who prefers to go off the grid with your electronics in tow. LG today announced the X charge, a smartphone that puts a priority on battery life. Similar to last year's X power, the X charge has an enormous battery with a capacity of 4,500mAh. Google recently updated the Google Fit application for Android and expanded its functionality to include a wider range of activities. The app gains more goal options and support for multiple goals, such as daily, weekly, and monthly goals for specific activities. 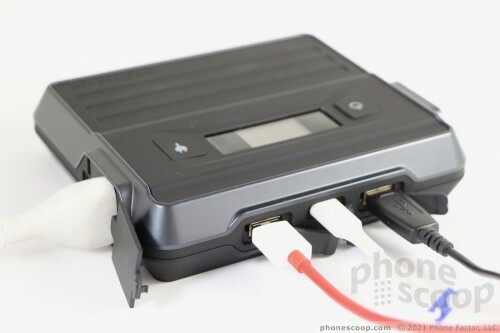 Why not just simply use your vehicle's automotive battery, thru the existing charging ports inside the car?